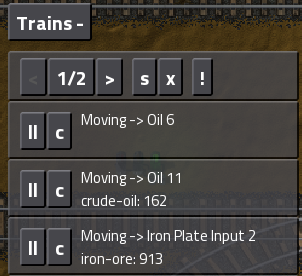 Here is a small mod I wrote so I could keep an eye on my trains. The Fat Controller allows you to track trains, see their next stop, if they are currently moving and the item in their inventory with the highest count, you are also able to remotely control trains and set their schedule. So all the features i initially planed are in this build. Next might be a train stats screen, showing how many items are going through the train network, how long trains are spending waiting at signals, that sort of thing. If you uninstall this mod, make sure you are out of remote control mode first unless you want to be stuck as a ghost, being a ghost is pretty cool. Last edited by Choumiko on Thu May 18, 2017 11:11 am, edited 70 times in total. That is what I always wanted , please devs put that into the main game. This sounds useful, I might try it out later, but I have no trains in my current map, just a really large logistics network. ...pData\Roaming\Factoria\mods\TheFatController|control.lua:27: Gui element with name fatController already present in the parent element. Updating Factorio to 0.10.1 did not help. I took a quick peek at the mod and it seems the mod does not support saving and loading. It doesn't save its fatControllerInit state when the game saves, so when it is loaded, the mod tries to initialize all over again, causing this crash. At least that's what I think is happening, I might be wrong. You should be able to load the game with the mod turned off just fine. I'm sure JamesOFarrell will release a fixed version soon. Rahjital wrote: You should be able to load the game with the mod turned off just fine. I'm sure JamesOFarrell will release a fixed version soon. Loading with the mod disabled works fine, only the windows remain on the screen doing nothing. Sorry about that, there were 3 lines in the script already to fix that bug but they were disabled for testing and I forgot to put them back in. New version has been uploaded with the fix for this. I am so sorry, it is an unplanned mess. I sat down to write it and just threw code at the problems I encountered instead of stopping and thinking. fatControllerInit is a local variable intentionally, it is supposed to init every time, it still supports loading and saving though as it stores all its state in the glob table. Thanks for helping out Rahjital! Oh, so that's how it works! I thought it was commented out because it was some debug stuff. It doesn't really matter, but just for dev OCD matters, wouldn't it be cleaner to just set your pointers to the gui elements again instead of destroying them and creating them again? Ah, I was glad to help! It's a great mod, truly useful for large railroads. Would it be possible to see an ETA for arrival to the next station? It wouldn't need to be accurate, just a rough estimate on how long would it take calculated from the speed of the train and distance to the station. Or maybe just showing the distance itself, that would work just as well. That would make the mod truly indispensable. Rahjital wrote: Oh, so that's how it works! I thought it was commented out because it was some debug stuff. It doesn't really matter, but just for dev OCD matters, wouldn't it be cleaner to just set your pointers to the gui elements again instead of destroying them and creating them again? Probably but it is so easy to just blow it away and let it be recreated if it is needed. That way i don't need to really think about the current GUI state at start up. Rahjital wrote: Ah, I was glad to help! It's a great mod, truly useful for large railroads. Would it be possible to see an ETA for arrival to the next station? It wouldn't need to be accurate, just a rough estimate on how long would it take calculated from the speed of the train and distance to the station. Or maybe just showing the distance itself, that would work just as well. That would make the mod truly indispensable. Things with stations are actually a little hard as I don't know where the stations are in game or the name of them. Once I rewrite how the state of this mod is stored and clean up the gui code a little I'll be in a better position to actually think about stations just thinking allowed I'll probably do something like finding all station entities near a stopped train and guessing which station it is based on the trains schedule. Once I do that I can do a rough calculation of ETA. The other thing I I could so is track the time it takes to travel between stations each time and display a guesstimation based on the average trip. I could add the X/Y coords or the distance from your player as I know both of these things already but they are not that useful. What maybe more useful is the current direction (N/E/SW...) as this would allow you to see at a glance which direction it is heading. Been playing with this mod today, found it very useful and fun, one thing I would like would be to give each train a name or have it show the name of loco so I know what each one in the list is doing, as atm it only shows where it is/ heading. JamesOFarrell wrote: Sorry about that, there were 3 lines in the script already to fix that bug but they were disabled for testing and I forgot to put them back in. New version has been uploaded with the fix for this. Thanks for the quick fix, will try it later. I do not follow are you saying i should play using Factorio v0.0.3. No, with v0.0.3 of this mod, which is linked to in the first post. I feel as everytime I leave the game I need to add the trains back to my list. I can't confirm wether it's everytime or just when the game crashes, but I know it's pretty damn frequent. SHiRKiT wrote: I feel as everytime I leave the game I need to add the trains back to my list. I can't confirm wether it's everytime or just when the game crashes, but I know it's pretty damn frequent. Can you post a save so I can check this out? I don't have this issue myself but it does not really surprise me that it is happening. The "trains" in the game at pretty temporary and seem to get recreated if anything changes about them (adding or removing a carriage). I have plans for fixing this issue by tracking trains in a different way. Hopefully I'll get some time to work on this mod over the upcoming weekend. The save I was playing is over 100MB, I'm starting a new one. I'll try to reproduce this in this new game. Thanks for the mod anyways, I love to remotely control the train. I feel like really fat! It happens whenever I add/remove wagons to the train. Maybe you could check, after the train is rebuilt, if he has the same name, locomotive position, schedule and from there guess that's the same train, and re-add it to the list.